AHF: In Memoriam - Rev. Imre Bertalan, Jr. In Memoriam: Rev. Imre Bertalan, Jr.
9/1/2017 - AHF and the entire Hungarian-American community mourns the loss of a great Hungarian and great American, Rev. Imre Bertalan, Jr.
Rev. Imre A. Bertalan, 67, of Ligonier, died Tuesday, Aug. 29, 2017. He was born Oct. 4, 1949, in New Brunswick, N.J., son of the late Rev. Imre G. and Margaret Kosa Bertalan. Rev. Bertalan was the executive director of Bethlen Communities since 1999 in Ligonier. He was an ordained clergy for the Hungarian Reformed Church of America and the Calvin Synod of the United Church of Christ. He was past president of the Rotary Club of Ligonier, and was a member of the Ligonier Valley Association of Churches and the Ligonier Valley Ministerial Association. He was board member and member of the Executive Committee of the American Hungarian Federation and very active and dedicated to the Hungarian-American community, serving as Chairman of the Board of the Kossuth Foundation. He was a staunch supporter of the Ligonier community as a whole and an advocate for Ligonier High School sports teams. He is survived by his wife of 37 years, Magdalene Ujvagi; five children, Sara (Jeff) Davis, Julia (Dylan) Bertalan, and Imre E. Bertalan, all of Toledo, Ohio, Magda (Jose) Bertalan, of Madison, Wis., and Margit (Brian) Bertalan, of Fayetteville, N.C.; five grandchildren; and two sisters, Lillian (Michael) Bertalan, of Schenectady, N.Y., and Sarah Bertalan, of New York, N.Y. In lieu of flowers, the family suggests memorial contributions in Imre's memory be made to the Bethlen Communities, 125 Kalassay Drive, Ligonier, PA 15658. On September 25th, members of the Hungarian Reformed Church of Washington, D.C., celebrated the Reverend Dr. Imre Bertalan Sr.’s 25th anniversary of pastoral service with the congregation. For 12 years, Rev. Bertalan served as the president of the Hungarian Reformed Federation of America, in Washington, D.C. During his service as president of the Federation, he joined the Hungarian Reformed Church of Washington, D.C., and led the congregation with other ministers. After he retired as president of the Federation, he devoted his entire time to the leadership of the church. During the celebration, the congregation’s chief elder, Zoltan Bagdy, greeted Rev. Bertalan, and on behalf of the church, and thanked him for his long service as a pastor. “We celebrate with a great deal of joy and thanks,” said Bagdy, “because the life of our church has been exceptionally successful during the past several decades, and these successes are permanent, and for all this we must thank Rev. Bertalan.” In his reminiscences, he mentioned that Rev. Bertalan for years held very popular Bible classes at his home for adults, on Wednesday nights; he prepared several generations of children for their confirmation, and held Bible studies for them, in Hungarian. Rev. Bertalan has been a patron and leader of the Hungarian Scouts in the Washington area; he maintains close contacts with Reformed Church members in Hungary, Transylvania,Slovakia; he helped Hungarian students for years; and he has been a supporter of the Bethlen Home for decades. “It is extremely important, that there is, in the capital city of America, a successful, well organized Hungarian Reformed Church, and that everyone in the capital be aware of that – the American Presbyterians, the politicians, “Embassy Row,” the press, the local Hungarians. For the fact that this indeed exists, we owe a great deal of thanks to Rev. Bertalan,” said Zoltan Bagdy. The church elder mentioned as well that Rev. Bertalan, with the financial contribution of the Chikesz family, established a unique program several years ago, which provides scholarships for Hungarian students to study at Wesley Seminary, and to serve as assistant ministers at the church during their studies. It is well known, that Rev. 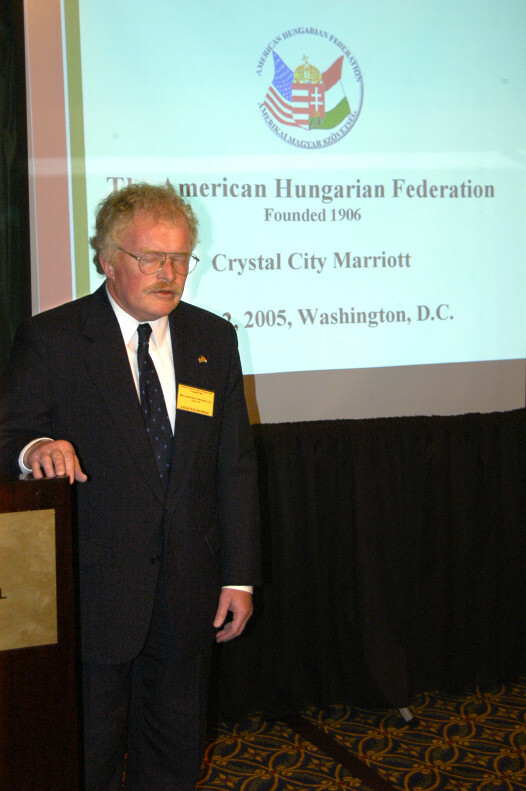 Bertalan, in addition to his pastoral work, is a selfless civic and community leader; he established several well known Hungarian American organizations and continues to serve as a leader of some of them, including President of the American Hungarian Federation (then President Emeritus), the American Hungarian Federation of Metropolitan Washington, D.C. and the Hungarian American Coalition as honorary president. After Zoltan Bagdy’s remarks, the representatives of the Joseph Batori Scout Troop greeted the Rev. Bertalan; they sang in his honor and recited poetry. Zoltan Bagdy presented Rev. Bertalan with the congregation’s anniversary gift, and the scouts also presented him with a gift, a plant in a hand painted flower pot. Members of the congregation also spoke, expressing their personal thanks to the minister, among them Frank Koszorus, Jr., a well known Hungarian civic leader and an elder of the Hungarian Reformed Church of Washington. The celebration continued after the religious service, during “szeretetvendegseg.” Here too, members of the church congratulated the Rev. Bertalan in person.